2nd!!!!!!!!!!!omg!!! and its quite fun and chalenging keep making games Bart. Congrats for the new game ! Brilliant game Bart, very catchy! OMG Bart, good job, really!!!! ahahah you are such a fool!!!! that's awesome!but hard!!! never made it to the bonus level.. really hard but awesome! Yep, very nice, but fast!! Finally a new Bonte Game. And it is as great as always :D Nice Job Bart. But the Bonus Round is really insane. Perhaps I'll give it another try later. Haha, so much fun!! Love it! Keep up the good work! Bonus round on a laptop made me go crazy though! Wie zegt dat klikken geen hard werk is, heeft trouwens ongelijk! Well done! Wish I could see the scores but I can't connect to facebook from this computer. Is it possible to post the scores off facebook? Mine was 39,600. Bonus round on second try. 37075 points after bonus. Fun game. I, quite frankly, didn't enjoy this one at all. It is far to difficult and the game effects are really annoying. 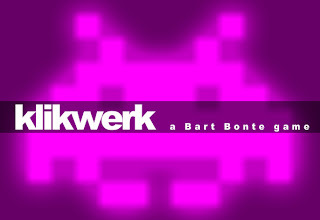 Klikwerk is mostlikely my least favorite Bonte Game. Awesome! I'm gonna post a link on another forum I know. 156075!!! Ow my eyes hurt... I made it to the bonus round first try :) Awesome game Bart! Please do another escape game Bart. Yours out-classed all the rest and I've been dying to play another of them! Nice one, a bit like Doeo (great classic). YEA A NEW GAME I HAVE BEEN WAITING FOREVER!!!!! i like 99% of your games. This one is brutally horrible. Que buen juego!!! Me quemaste la cabeza!!!! Larga vida a Kraftwerk!!!! mmmmmmmmm i already want a second one! This game is absolutely awesome. I had lots of fun and the music is totally radical. Great job!!!! Thanks for the compliments all! Are you trying to drive me insane? It's a good game, but once was enough for me. I will pass it on to friends though. Wouldnt this work well on a Wii?? klikwerk is challenging, fun, and original(i think). But but but - I am used to your games always being so relaxing and now i'm all wound up! I love Bart Bonte games!!!!!!!!!! !....but sadly this one just wasn't the kind of game I like. you can't please everyone, but keep making games because I LOVE THEM!!!!!!!!!!! Great game but very very hard. I wish it wasn't quite so fast. Least favorite. Not sure I played even thirty seconds. I use a laptop (with a touch pad, no mouse), so speedy-mousing games leave me cold. I didn't like the text flashing up and telling me about the bonus level after 30k whilst I'm playing there's a whole screen and intro the give me that info - but loved the game otherwise!! would you say scoring 63350 is a lot? or a little? Are you Dutch? The name 'klikwerk' sounds so Dutch! Oh, and I love the music element in the game! Oh, laat maar, ik zie net dat je inderdaad Vlaams bent (niet Nederlands, mijn excuses). Ik ben zelf een Nederlandse dus dan ga je er eerder vanuit dat iemand Nederlands dan Vlaams is :) In ieder geval mijn complimenten voor al je spelletjes! Ik speel ze altijd met veel plezier! Nice speurwerk :) Vlaams inderdaad en bedankt voor de complimenten! Dit spel is geweldig! Moet op Steam! Oh my! I have a high score of 74225!!! Just wanna know, why you have made a sequel to the game Klikwerk, Tap tap tap? OH MY GOD I FINALLY UNDERSTAND THE NAME OF THE GAME. It took me so long to realize it's a reference to Boing Boom Tschack. It even has a similar beat to it. And the name Klikwerk. Oh my god. So I'm not crazy for thinking that it is a reference to Kraftwerk's Boing Boom Tschack? THIS IS SO AWESOME!!! !